The creator and proud editor of La Liga Blog, Andy began his love affair with Spanish football after spending a placement year abroad in Spain and in the process began following the ups and downs of his local Andalusian club, Malaga FC. His favorite Spanish player is Carlos Puyol, his favorite Spanish tapas is Empanadas and in his spare time is an amateur footballer, trying (but normally failing) to add a bit of Spanish flair to his local Saturday league side. Savvy journalism student Tom Wellman joined the La Liga Blog team last year and has since become a regular contributor to the site offering his insight into many different aspects of Spanish football. He’s an Atletico Madrid supporter by trade but also takes a keen interest Athletic Bilbao due an adoration for famous their red and white kit. You can read his personal blog and examples of previous work here. 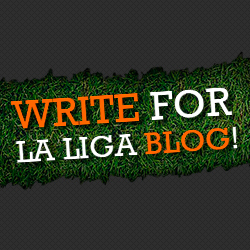 Just 25 years old and an avid fan of Spanish football, Kenny joined the La Liga Blog team for the start of the 13/14 season. He is a full time scientist by day and a football anorak by night with his favourite teams being Atletico Madrid and Liverpool. His favourite ever Spanish player was Fernando Torres in his prime, now it is Jesus Navas. Juan Ramirez is a La Liga advocate based in the United States as a full-time student as well as being in full-time employment. A passionate ‘soccer’ lover since his childhood, he follows Liga MX (Mexico) and his favorite team is Chivas De Guadalajara. He also is a keen supporter of both Manchester United and Barcelona. Follow him on twitter at @juancarami21 to discuss football or anything else. Paddy is an 18 year old aspiring sports journalist and will study Sports Journalism at University in 2015. After living in Spain for almost two years, he developed both a passion and an ‘unrivaled’ love for Spanish football and in particular, Real Madrid! Due to injury his ability as a footballer declined and he is now a Performance Analyst for League 2 side Cheltenham Town as well as being a full-time college student. His favorite players are Kaka, Thierry Henry and CR7. You can find him on Twitter at @paddy_hendy. David Noronha is my name and I am currently studying for an MA in the United Kingdom. I have been a La Liga lover for several years now, initial memories include seeing Patrick Kluivert regularly smashing in the goals for Barcelona. Fortunately I have attended the Camp Nou on a match day. And subsequently can brag about viewing Messi, Xavi and Iniesta in the flesh. I would love to one day live in Barcelona and write about the fortunes of both outfits.